T Allan Comp, Ph.D. received national recognition for his work with the people of Appalachian coal country, for his successful effort to engage the arts and humanities in environmental recovery, and for his remarkable choreography of multiple federal agency partnerships in working with rural communities across the United States. Recognized as an artist, thinker, and speaker, Comp was once described as "a relaxed blend of John Muir, John Dewey, and John the Baptist." An employee of the Department of the Interior, Office of Surface Mining Reclamation and Enforcement, Comp has been profiled by Orion Magazine, named a Purpose Prize Fellow by Civic Ventures, and was the first federal employee to be named a National River Hero by River Network. In September 2009, he was awarded the Service to America Medal in the Environment category by the Partnership for Public Service, the highest award a federal employee can receive. An historian of Technology with a long engagement in cultural resources, community redevelopment, and environmental reclamation, Comp is committed to the recovery of communities challenged by environmental degradation. Sara was born and raised in Albany, New York. She earned her Bachelor’s in Ecology and Evolution at the University of Maryland College Park and her Masters in Conservation Science from Imperial College London. Sara is interested in a wide range of environmental and conservation issues. 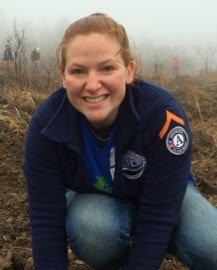 As the Public Administration Fellow at OSMRE, Sara works closely with the staff of the DOI and OSMRE/VISTA teams. She enjoys working with people from across the country as they make a measurable difference in their communities.